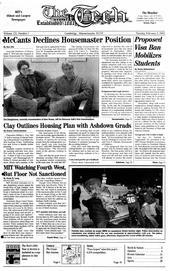 There’s been a lot of talk lately about the Shin family’s wrongful death suit and what it means for MIT. But amidst the press conferences and the legalese, I think a few basic facts have been lost. It is important to realize that the “specific chronological facts” are merely a description of what the Shin family claims happened. We’re only hearing one side of the story here. The Shins get to hold a big press conference and say whatever they want, whether it’s true, false, or complete speculation. MIT can’t publicly refute those claims (even if they’re complete fabrications) because of medical confidentiality laws. There’s no incentive to tell the truth here, but there are plenty of disincentives: greed and grief are powerful emotions. In our legal system, the truth can only emerge after both sides have had their say and presented their evidence. Until MIT makes its case, we can’t just assume that the Shins are right. If they were really interested in justice they would release the medical records to the public (or press) so that we could evaluate them for ourselves. Why haven’t they done so? What are they afraid of? The Shins are desperately hoping we won’t notice a few inconvenient facts. For example, this is a civil case. If the district attorney believed MIT had committed a crime (such as manslaughter, negligence, or reckless disregard for human life), they would have prosecuted MIT in a criminal court. That is a lot more serious; lose a criminal trial and you go to jail, lose a civil trial and at worst you lose money. The standard for conviction is usually lower in civil courts (“reasonable doubt” versus “a preponderance of the credible evidence”), but prosecuting these crimes is the district attorney’s job. If this is such an open and shut case, as the Shins claim, then why isn’t the DA prosecuting? For that matter, why are the doctors named in the suit still practicing? If what the Shins are saying is true, then a complaint to the state medical board should have ensured that these physicians were stripped of their licenses to practice medicine. Perhaps the Shins didn’t bother to file a complaint. After all, even if the board believes you, you won’t get any money from them. Or perhaps they did file a complaint and the licensing board didn’t believe them. Winning before a licensing board is easier than winning in court; there are no pesky rules of evidence to deal with. The inconvenient facts don’t end there. We’re being presented with a story that doesn’t quite fit together. For example, the Shins complain that although they knew their daughter was hospitalized at McLean Hospital in February of her freshman year, they didn’t realize she was suicidal. But McLean is a psychiatric hospital; how could you know your child was at a psychiatric hospital for a week and not find out why? People don’t go to psychiatric hospitals for paper cuts. Elizabeth’s entry into a psychiatric hospital seems especially worrying in light of the problems she had with depression before coming to MIT. A large chunk of the Shins’ complaint was that MIT didn’t tell them what was happening (“Silly Institute; medical privacy laws are for kids!”). The doctors couldn’t legally talk to them. But, if they asked their daughter to sign a confidentiality waiver, the doctors would have answered all their questions. I’ve actually done this; all it takes is a signature. Why didn’t the Shins ask to speak to their daughter’s doctors when she was hospitalized for a week at a psychiatric hospital? Why didn’t they ask her to sign a waiver so they could talk to those doctors? If she refused, there still remains a simple solution: stop paying for school. Give her a choice between medical confidentiality and tuition. The bottom line is that I don’t think the Shins are telling the whole truth. It seems that some of the “facts” they’re presenting are sheer speculation. That’s not necessarily unethical; it’s what you have to do -- construct a coherent story in order to win the public relations game. That is the real battle the Shins are fighting. With enough bad publicity, they can bully MIT into paying them anything they want, regardless of truth or justice. So if the Shins aren’t telling us the whole truth and nothing but the truth, what really happened? We know that she was very smart and that she was suicidal. Unfortunately, when brilliant people want to kill themselves, they tend to be all too successful. Beyond the facts of the case, there lies something that is quite disturbing. The Shins imply that if there was anything MIT could have done to prevent the suicide, they should have done it. That sounds like a perfectly reasonable argument except for the fact that it is insane. Imagine if MIT did everything possible to prevent traffic accidents on campus. It’s an impossible goal and trying to meet it will only exacerbate the problem. Our goal should be to minimize, not eliminate, suicide. That means that no matter what, there are going to be suicides and although each one is a terrible tragedy, we shouldn’t destroy medical confidentiality and turn this place into a prison to prevent suicides. I’m an adult. I should be treated like an adult. Although it may appear that treating me like an infant is a good way to keep me from committing suicide, it’s not a solution to the problem. Treating me like an infant is a pretty colored Band-Aid that makes you feel better without fixing the problem. I’m not saying MIT’s Mental Health services and Counseling and Support Services are not sub-par. But that is not what the Shins are alleging. They’re saying that MIT’s facilities are substandard. Somehow I doubt they would have seen better medical care at a random state university with 40,000 students and four staff psychiatrists. I really hate the idea of defending MIT, even temporarily until they can make their case, but I’m just so sick of watching vultures line up for the legal gravy train. That $27 million the Shins want is coming out of my pocket (and yours) and I really don’t think that is fair. I didn’t have anything to do with this girl’s death and I don’t see why I’m being punished for it. If the Shins want to be millionaires I suggest they work hard rather than use their daughter’s suicide as a cover for stealing from MIT students. I’m really sorry that this girl had her life snuffed out at such a young age. She seems like the kind of person I would have really liked. I feel for her parents; losing a child is the hardest thing anyone can face. The fact that it was a suicide makes it even worse. I sympathize with these people, I really do. But I won’t write them a blank check just because they experienced a terrible tragedy. Michael J. Salib is a graduate student in the Department of Electrical Engineering and Computer Science.